Some Egypt players could face bans of up to one year after doing unauthorized television interviews during the team's nightmarish World Cup campaign, the Egyptian Football Association (EFA) chief said on Tuesday. Local reports said several players took up to $5,000 to speak to a Saudi-owned television channel before Egypt's clash against hosts Russia in their second Group A game of a World Cup campaign to forget. Many fans pointed the finger at what they called "unwanted distractions" at Egypt's training base in Chechnya capital Grozny and were further incensed after reports emerged of the television channel's reporter sneaking in to the players' rooms to record interviews. 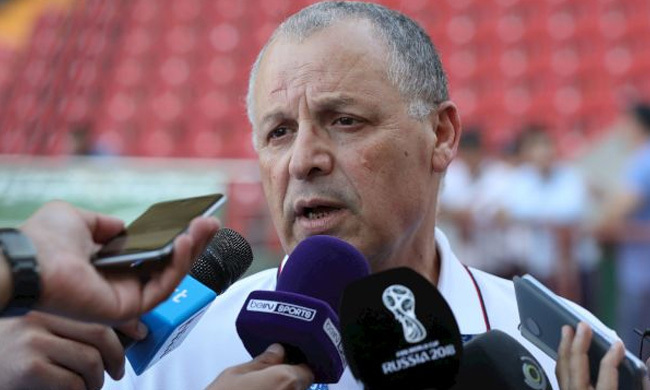 "I instructed (Egypt team director) Ihab Leheita to take a firm stance over the interviews that were done for a satellite television channel," EFA president Hany Abo Rida told reporters on Tuesday. "These interviews violate the (EFA's) sponsorship deals … some players will be internationally banned for up to a year and will also be fined." The Pharaohs buzzed with excitement after making their first World Cup appearance since 1990 but their hopes were shattered in Russia as they lost all three games. They conceded a last-gasp goal in a 1-0 defeat by Uruguay, lost to hosts Russia 3-1 after collapsing in a 15-minute second-half spell before Saudi Arabia rubbed salt into their wounds with a stoppage-time winner to down them 2-1. Back home, Egypt players and coach Hector Cuper came in for fierce criticism. Argentinean boss Cuper was vilified for what many termed an "anti-football defensive strategy" that put them on the back foot against their opponents. The EFA opted not to renew his contract following the World Cup debacle. Egypt are now on a lookout for a new coach amid reports linking them with Morocco's French manager Herve Renard. "We are looking into many CVs and we will draw up a final shortlist of three coaches," Abo Rida added.